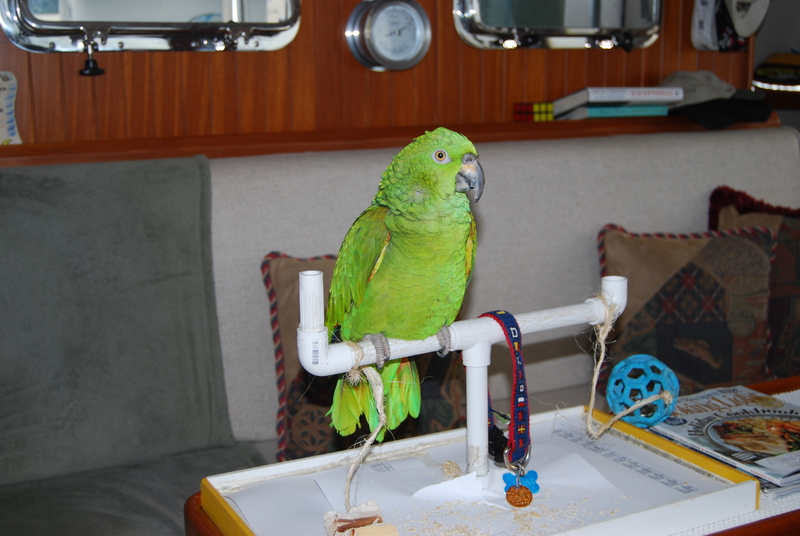 Most of our followers know that we travel with Nate, our 38 year old Amazon Parrot. Over the years, we have learned how to jump through all the hoops when traveling in and out of the country to Canada. Nate is considered an endangered species and requires a CITIES passport issued by The Dept. of Fish and Wildlife for travel outside the U.S. We knew there would be difficulties to overcome on our upcoming trip to the Bahamas. But…….who would have ever thought this little green bird would cause such impossible requirements as we are now faced with. We first applied to the Bahamas on December 1, 2015 for a pet permit that would allow us to travel to the islands in the spring of 2016 with Nate. The Bahamian Dept. of Agriculture stated that they would only accept cash $15.00 (no checks or credit cards) with their one page application. The address was to a P.O. Box and tracking was not available. Allow four weeks for the permit. This is a standard requirement of any animals brought into the country. Easy enough. After six weeks and no permit, our phone calls started. The Bahamas has no record of our application or $15 (surprise). After four days and 16 phone calls along with numerous faxes, each time being transferred to another person, we are told to send an international money order via FedEx to a street address. Easy but expensive. FedEx confirmed delivery and the phone calls resume. Finally, I am transferred to the permit director who confirms they have our application but he is now asking that I send Nate’s CITIES passport to him. More $ ? Bribes? We protest saying nothing was ever mentioned about needing this during our 16 phone calls or on their web site. Within the hour, our two page Bahamas Permit arrives by fax. One hurdle down. Having traveled to Canada in years past, we already had Nate’s CITIES endangered species international passport issued by Fish and Wildlife Services (FWS). Procedure: We have him stamped out by FWS a few days prior to leaving the U.S. at an official port ( done in person so they can see the bird), stamped into the Bahamas when arriving by Bahamas Customs (they don’t care or know what they are looking at), stamped out when leaving by Bahamas Customs and then stamped back into the U.S. by FWS at an official port. From our past travels, we knew that a visit to the Fish and Wildlife office in Miami would be required just before our departure to stamp Nate’s CITIES passport out of the country. In talking with FWS, we learn the only ports available to us are Miami or Boston. Ouch…we had planned on driving up to Miami to have Nate stamped out but we were not coming back to Miami on the return. OK, change of plans. We will divert and come back into Miami on our return from the Bahamas. One more hurdle down! Lastly, Nate needs an international health certificate issued by an avian veterinarian (bird visit and swabbed, $70) and certified by a USDA veterinarian 48 hours prior to leaving the country. The Vet in Marathon can do the health check. It then needs to be stamped by the USDA vet. Again, Miami or Boston so driving to Miami it is. USDA doesn’t need to see Nate, they only need a check for $38 to stamp the health certificate. Looks like we have everything covered! Wrong! We knew that Nate would have to be inspected by the USDA vet on our return from the Bahamas. So while talking with her about our departure procedures we ask about this. She informs us that we will also need a Health certificate from the Bahamian Government 24 hours before leaving the Bahamas. Nassau appears to be the only place this can be done. We are not going to Nassau and we certainly don’t want Nate inspected and swabbed in the Bahamas. Remember this little bird never even gets off the boat. The USDA vet next drops another bombshell. After arriving back in the US and inspected, Nate must stay quarantined on our boat for 30 days. Again, not a problem. He never gets off the boat. She then ask where the boat will be staying in Miami. A second exam will be needed 14 days later along with a fee of $300. If we leave Miami, we will have to tell the USDA where we will be and also pay for a USDA vet’s time/per diem/travel for the second exam (approximately $1000). Let’s see, Miami Marina @ $200 / day, quarantined boat, vet fees….USDA is freaking out about diseases entering the U.S (Zika, Avian Flu, and Newcastles disease). Traveling to the Bahamas with Nate is not so easy now; darn near impossible. Nate would have to be examined 4 times, boat quarantined, travel delayed one month, and major $$$. We don’t want Nate traumatized. A hard decision is made. We will board Nate at Birds of Paradise in Stuart, FL. He has spent time there in birdie daycare and a few overnights last month. He seemed to like it, made new friends, and learned new words (“thank you”, it’s a very polite place). 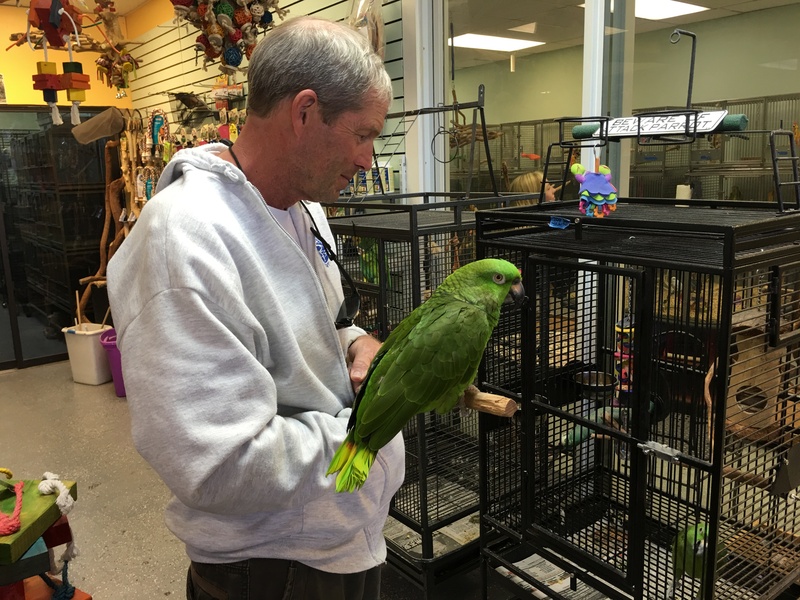 Dana, the owner, is a professional parrot breeder of 30 years and has a separate boarding facility. We will be separated from our pet for two months. Not an easy decision to make but a necessary one. We will make the four hour drive to Stuart just before leaving Marathon. On our return from the Bahamas we will enter at Ft. Pierce and drive down to Stuart to be reunited with Nate. Two months without our crew member will be hard. We hope he will not be too traumatized by all of this. This entry was posted on March 9, 2016 at 6:02 pm. You can follow any responses to this entry through the RSS 2.0 feed. You can leave a response, or trackback from your own site. 1 Response to "A Birds Tale"
Unbelievable that one little bird,so loved and cared for, could command this much attention from two governments and their myriad collection of not enough to do government bueracrats, not to mention the veterinarians required for this bs.Meanwhile, in some government subsidized wind farm endangered birds are being swatted out of the sky on a daily basis. We live in a funny world folks! Best of times in the Bahamas on your trip! Patrick Hughes, Knoxville Tn.